A few weeks ago I went shopping at Costco, and when I got there, my membership card had expired. They issued me a temporary card, and said I could do my shopping while they sorted out the renewal. I mentioned that I thought I had a rebate check somewhere at home, and asked if they could find it in their system and apply it to my $120 renewal fee. The manager said she would look into it, and that by my next shopping trip, she should have it sorted. I left that day with no expectations, thinking it highly unlikely that a manager at a national chain big-box store would actually follow up, much less even have the technological means to accomplish this task. Can you imagine a manager at Home Depot, or Best Buy doing something like this? Heck no. Fast forward to last night. I arrive at Costco for my regular grocery run, having completely forgotten about this previous encounter, but remembering my card was expired. I go see the manager. She begins investigating the hold. She pulls out this massive three ring binder, stacked full of individual emails of managers discussing and solving problems for individual customer accounts, printed on actual paper. There is an email with my name in the subject line, written by the manager from before. In it, she clearly details out her investigation, and finds that, in fact, I haven’t cashed a rebate check in 7 years. She has the individual years, and the individual amounts listed out precisely. The manager on duty, tally’s up the total, and says, “William, it looks like we owe you $279”. She reached into the register, and handed me cash. “Have a nice evening.” she said with a smile, and continued about her work. His experience left a profound impression on our team. Costco has always been legendary for their customer service, among other things, but none of us knew the level of detail with which they serviced their customers. In the cutthroat world of retail, and any business for that matter, customer service has become a requirement for success. But to stand out from the sea of competitors vying for customer attention, companies must do more than just service their customers, they must cater to the holistic experience of the customer. Brands like Apple, Zappos and Amazon have established the standards for how customers want and expect to be treated. Big companies know that for a company with over one billion dollars in annual revenue, a slight improvement to customer experience can generate an ROI of $823 million over a three year period. Customer Experience is not just for big brands, smaller companies can benefit from it too. Investing in Customer Experience increases the bottom line, decrease churn rate and increases customer satisfaction. There are many ways to take care of customers and how to interact with them, but these are often not the same thing. Customer Experience is often used interchangeably with Customer Service. While there are a lot of overlap, there are major differences in the two. Customer Experience is the sum of all the experiences, interactions and touchpoints of a customer with a company. Customer Experience is a holistic view of the entire customer’s journey with your brand While Customer Service is the assistance a company provides to customers if they have questions or issues that needs to be resolved. However, Customer Service is only one aspect of the Customer Experience. In our colleague’s example, Costco provided him with a temporary card so that he could shop even after his membership expired; that’s good Customer Service. But when they went above and beyond their service and offered him money after launching a full investigation, now THAT is excellent Customer Experience. The key difference is that Customer Service is reactive while Customer Experience is proactive. Customers reach out to the company when they have an issue or a problem which makes it a one time interaction. Customer Experience aims to reach the customer at every touchpoint of their journey. Like most things in any marketplace, customer experience has changed. It takes sustained efforts to drive and strengthen the customer experience through new avenues such as technology. Across multiple industries, consumers prefer better customer experience over lower prices. When it comes down to price, Customer Experience always wins. In the age of the experience economy, where merely delivering good products is the minimum entry requirement for brands, differentiation and business success requires delivering better experiences than the competition. It’s about creating ‘wow’ experiences that differentiate the brand in customers’ minds, make them want to come back for more, and bring their friends too. Customer Experience is not just a buzzword, it should be at the heart of everything a company does. A survey by Bloomberg Businessweek found that delivering great customer experiences has become a top strategic objective by executives. Yet, this vision has not translated well to company’s key activities. In a Bain & Companysurvey, 80% of organizations believed that they are delivering a superior experience. While only 8% of customers believe they are receiving a great customer experience. The disparity comes from two things: 1) companies seeking short term profits that lead to alienation of the customer (e.g. transaction fees) and 2) the difficulty of creating and maintaining good relationships with the customer. So how does a company bridge the gap? Simply by relentlessly treating their most profitable customers in a way that they would come back for more and recommend the company’s products and services to their family and friends. A tactic that Costco does exceptionally well. As a service-oriented software and consulting agency, we have often come across these disparities with our own clients. 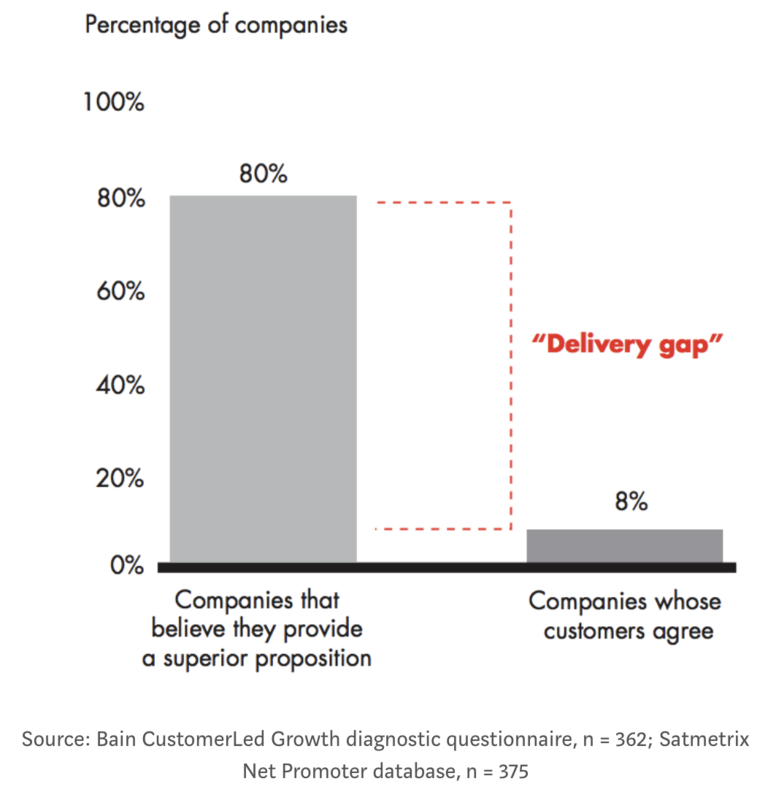 It’s difficult to close the delivery gap without making tough decisions. When it comes to choosing between short term profits and our customer’s well being, we always choose our customers. What separates the mediocre agencies from the really great ones is the ability to make the difficult decisions that will benefit the customer. If we protect our clients in the long run, we will create a loyal customer base that would come back for more and recommend our company to their friends. When starting a business, it’s easy to fall into the trap of targeting as many people as possible. This spray and pray method is not effective in delivering the right message to the right people, which ends up costing the company a lot more money. In Novvum, we have a very specific customer in mind. Our customers are CTO’s/High Level Executives of hockey-growth startups that need our services to help them scale. These executives have a lot of things in common such as lack of time, knowledge or resources to take their company from a seed funding to Series A. Be as specific as possible with your user persona as this will help you design a better experience along multiple touchpoints of the customer’s journey. Steve Jobs, the person who architected the infamous Apple customer experience, advocated for “beginning with the customer experience and working backwards to the technology”. It’s easier to start with the end in mind because it paints a desired goal that we want to reach with our customers. It becomes our frame of reference when we are evaluating our customer’s experience and whether we are doing achieving that goal. Creating a clear customer vision will drive the behaviors of the organization. We’re founders, entrepreneurs and customers who have gone through the process of building our own company. Because of that foundation, we understand what it’s like to be in their client’s shoes. We like being boots in the ground working with you, helping you with your product. Most companies have this aloofness with you as a client, and we get it, it’s only business. But we operate in a different way. Each and everyone of us genuinely is looking out for the client. We believe strongly in the success of our customers, so much so that we would turn out profitable projects if it does not serve our client’s best interest. Emotional connection is hard to quantify in a company, let alone create. But in the context of Novvum, we go out of our way to make sure that we are delivering the best service to our clients. Some agencies have client relationships they they leave to their account managers. But we are the complete opposite; we are not afraid to get our hands dirty. With one client, we visited several high schools to hand out our client’s physical products and onboarded students to the app. For us, customer experience is not just another mantra, it’s a way of life. Software development is a tough business to be in, layer on top of that the tricky landscape of client relationships, and it makes it even tougher. Successful relationships are built on trust. We operate in this same belief by being transparent with our projects, our clients, our pricing and our team. Being open about our company facilitates trust and shows to the client that we are not hiding anything. It facilitates collaboration between us and the client easier and faster. Customer trust is a major driver on the customer experience. The story of Novvum begins and ends with our clients. Novvum is the story of our customers and their journey. For us, Customer Experience is not just a buzzword, but it is the core of everything that we do here in Novvum.